Some of the features that this article will talk about have already made their way into various other projects a long time ago, most notably ownCloud Documents and ViewerJS. Such features will have been mentioned before in other posts, but this one talks about what is new since the last release. 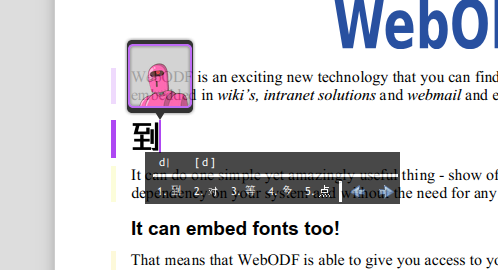 WebODF has had, for a long time, an Editor application. This was until now not a feature ‘supported’ to the general public, but was simply available in the master branch of the git repo. We worked over the months with ownCloud to understand how such an editor would be integrated within a larger product, and then based on our own experimentation for a couple of awesome-new to-be-announced products, designed an API for it. As a result, the new “Wodo” Editor Components are a family of APIs that let you embed an editor into your own application. The demo editor is a reference implementation that uses the Wodo.TextEditor component. Wodo.TextEditor provides for straightforward local-user text editing,by providing methods for opening and saving documents. The example implementation runs 100% client-side, in which you can open a local file directly in the editor without uploading it anywhere, edit it, and save it right back to the filesystem. No extra permissions required. Wodo.CollabTextEditor lets you specify a session backend that communicates with a server and relays operations. If your application wants collaborative editing, you would use this Editor API. The use-cases and implementation details being significantly more complex than the Wodo.TextEditor component, this is not a ‘supported’ part of the v0.5.0 release, but will, I’m sure, be in the next release(s) very soon. We are still figuring out the best possible API it could provide, while not tying it to any specific flavor of backend. There is a collabeditor example in WebODF master, which can work with an ownCloud-like HTTP request polling backend. These provide options to configure the editor to switch on/off certain features. SVG Selections. It is impossible to have multiple selections in the same window in most modern browsers. This is an important requirement for collaborative editing, i.e., the ability to see other people’s selections in their respective authorship colors. For this, we had to implement our own text selection mechanism, without totally relying on browser-provided APIs. Pinch-to-zoom was a feature requested by ownCloud, and is now implemented in WebODF. This was fairly non-trivial to do, considering that no help from touch browsers’ native pinch/zoom/pan implementations could be taken because that would only operate on the whole window. With this release, the document canvas will transform with your pinch events. 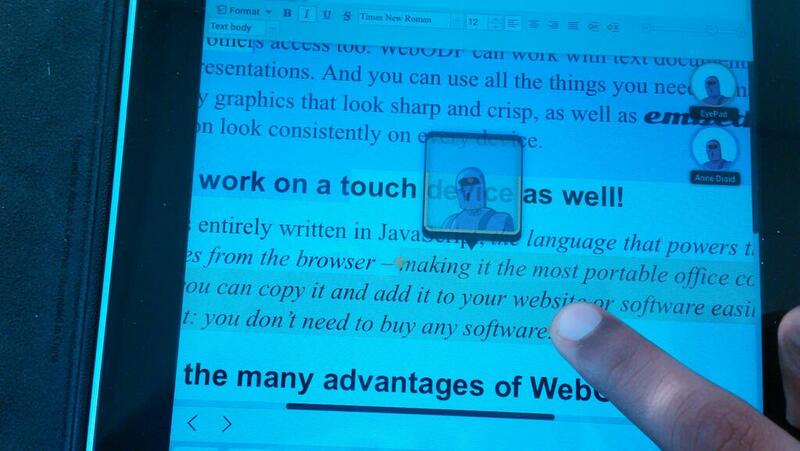 Another important highlight is the implementation of touch selections, necessitated by the fact that native touch selections provided by the mobile versions of Safari, Firefox, and Chrome all behave differently and do not work well enough for tasks which require precision, like document editing. This is activated by long-pressing with a finger on a word, following which the word gets a selection with draggable handles at each end. More collaborative features. We added OT (Operation Transformations) for more new editing operations, and filled in all the gaps in the current OT Matrix. This means that previously there were some cases when certain pairs of simultaneous edits by different clients would lead to unpredictable outcomes and/or invalid convergence. This is now fixed, and all enabled operations transform correctly against each other (verified by lots of new unit tests). Newly enabled editing features in collaborative mode now include paragraph alignment and indent/outdent. Benchmarking. 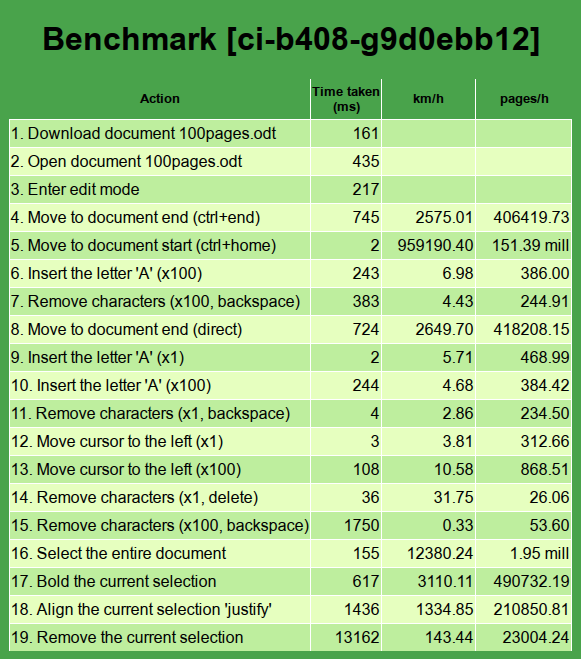 Again thanks to peitschie, WebODF now has benchmarks for various important/frequent edit types. Edit Controllers. Unlike the previous release when the editor had to specifically generate various operations to perform edits, WebODF now provides certain classes called Controllers. A Controller provides methods to perform certain kinds of edit ‘actions’ that may be decomposed into a sequence smaller ‘atomic’ collaborative operations. For example, the TextController interface provides a removeCurrentSelection method. If the selection is across several paragraphs, this method will decompose this edit into a complex sequence of 3 kinds of operations: RemoveText, MergeParagraph, and SetParagraphStyle. Larger edits described by smaller operations is a great design, because then you only have to write OT for very simple operations, and complex edit actions all collaboratively resolve themselves to the same state on each client. The added benefit is that users of the library have a simpler API to deal with. 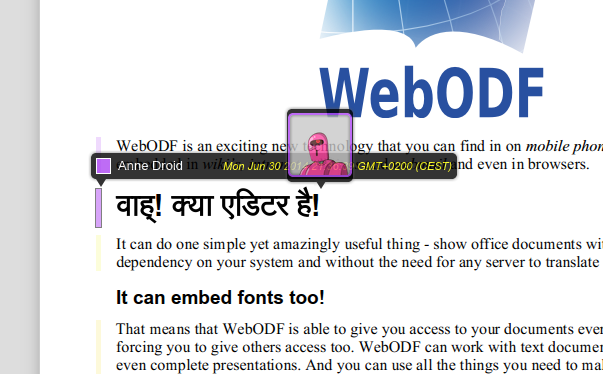 We now have some very powerful operations available in WebODF. As a consequence, it should now be possible for new developers to rapidly implement new editing features, because the most significant OT infrastructure is already in place. Adding support for text/background coloring, subscript/superscript, etc should simply be a matter of writing the relevant toolbar widgets. 🙂 I expect to see some rapid growth in user-facing features from this point onwards. Thanks to the new Components and Controllers APIs, it is now possible to write native editor applications that embed WebODF as a canvas, and provide the editor UI as native Qt widgets. And work on this has started! The NLnet Foundation has funded work on writing just such an editor that works with Blink, an amazing open source SIP communication client that is cross-platform and provides video/audio conferencing and chat. To fulfill that, Arjen Hiemstra at KO has started work on a native editor using Qt widgets, that embeds WebODF and works with Blink! Operations will be relayed using XMPP. Migrating the editor from Dojo widgets to the Closure Library, to allow more flexibility with styling and integration into larger applications. OT for annotations and hyperlinks. 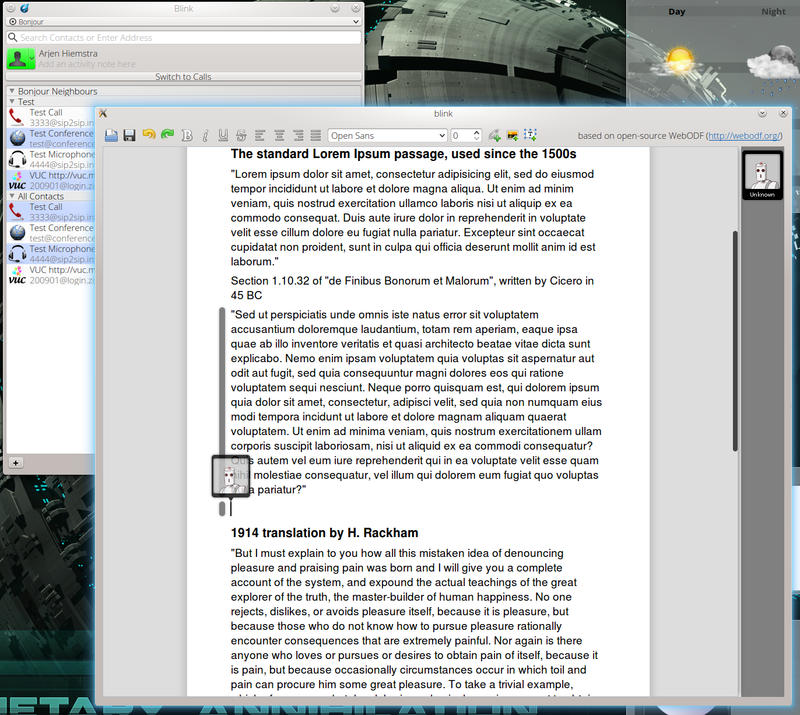 A split-screen collaborative editing demo for easy testing.